HabitRPG is a web-based productivity tool that takes on the guise of an online role-playing game. You gain experience and gold by ticking off items on your to-do list, building good habits, busting bad habits, and more or less making yourself a better person. You take damage when you leave daily tasks undone, and you can reward yourself with either self-created rewards or new equipment for your character, which helps you defend against your own non-productivity as well as against bosses in quests. Yes, I said quests. HabitRPG’s party system allows you to join with friends or strangers into a party, which makes you eligible to do quests. The party and quest system creates a sort of group accountability, as when on a quest, one group member’s failure to complete items on his or her daily task list deals damage to the entire party. 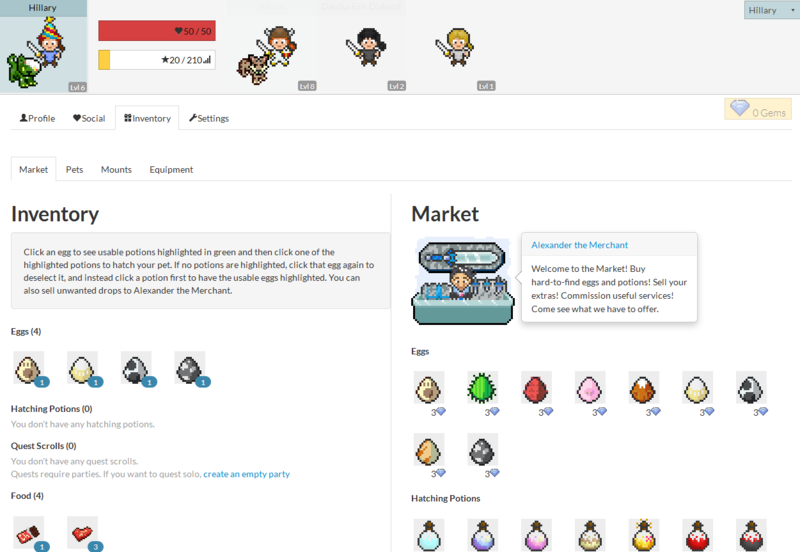 HabitRPG has most of the things your standard RPG offers: parties, guilds, quests, items, pets, mounts, classes, drops…It takes the reward system of a game and applies it to something in real life that will help you grow as a person, in your career, or just be a little better about getting things done. I’ve only started playing this week, so I’m still feeling out a lot of the game mechanics. But the to-do list system it provides, as well as those familiar XP and HP bars are enough to help me stay on track much better than I have in ages. The level of gaming skill needed to play HabitRPG is somewhere around “I can play a board game.” Even though it’s an online game, it’s not like playing World of Warcraft or Star Trek Online or anything that really requires any kind of aim or coordination. Nothing about HabitRPG is fast-paced. Its speed is determined only by the urgency of the items on your to-do list, and you only take damage once a day. How well or poorly you do is based entirely on whether you do the things you said you’d do. And sure, the whole thing runs on an honor system, so you could cheat or set up tasks that are so easy to tick off that you’re pretty much giving yourself free points instead of really working to better yourself, but if you’re just looking to build an epic character without taking advantage of the productivity mechanic, you’d probably have more fun playing D&D or Shadowrun. We all have more habits we want to cultivate and more tasks that we mean to do on a regular basis than we realize. For the daily habits list, the option exists to only do those items certain days of the week. So, if you mean to go to the gym, but you only mean to do it three days of the week, you can set up the task such that it only shows up on the days you mean to go. Likewise, you can always add more items to your lists. I only started out with a few daily items and habits, but as I went about my life as usual, any time I thought “I need to do this more often,” or “I need to get this [specific task] done,” it would get added to the appropriate list. 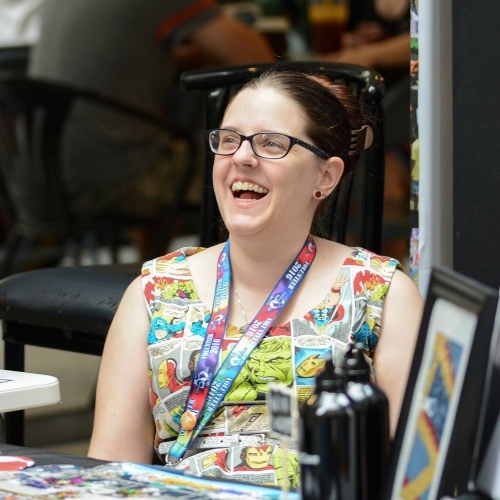 Some of the items are typical, like “read for enrichment for at least 20 minutes,” or “do the dishes,” or “exercise for 30 minutes,” or (since I’m a writer and it’s my art and what I do) “write something.” Those are all on my “dailies” list. My habits list is composed of mostly two things: items that are “bonus points” for my dailies (like working longer on a contract than I’d scheduled or doing more than my minimum self-requirement for personal growth study, and items that most people might call “freebies,” but a lot of those items are harder for me to accomplish than my daily tasks and are meant to bolster and support my mental health. Among these are “meet someone new” and “talk to someone (in person or on the phone).” Since I’m self-employed, it is actually possible (and completely not unusual) for me to go days without speaking a word to anyone other than myself, my pet fish (when I have one), or my plants. I also realize this is not exactly a good thing. So I make it a rewardable goal for me to seek non-virtual contact with people, because if I go too long without it, the idea of it actually starts to freak me out a little. And that’s bad. Most likely. If you can break down your tasks into positive and negative habits, daily/regular tasks, and one-off to-dos (or even just one or two of those), and actually seeing progress in the form of checking things off a list and building a character with increasingly awesome equipment and skills is something that motivates you, then HabitRPG should help you move at least some part of your life forward. I’ve really barely touched on all of the features this game/tool has and what it can lend to your life in terms of both utility and entertainment. It costs nothing to create an account or play, so if you’re looking to try something new for the new year and get a few more things done, it literally costs you nothing to give it a shot. I’ve even got my mom playing to help her keep up with her physical therapy exercises and stop snacking out of boredom. There’s an app for that. Well, there is for iOS and Android, anyway, and most mobile browsers can display the website just fine if you happen to be on a Windows phone. If you’re on a Blackberry, then (first of all) I’m sorry, and I really have no idea whether anything will work for you. Ever. If you’re planning on using the app, I recommend registering a local account with HabitRPG instead of linking it with your Facebook or Twitter. If you do the latter, you can still use the app, but since they haven’t properly enabled the account linking feature yet, you’ll find yourself having to type in some Very Long database codes in order to be able to track your progress on the app. I’ve only just installed the app on my phone, but so far it seems like it syncs with the web interface pretty nicely. I’m not really sure why you’d want to, but sure. Hit me up on Twitter (@lamenta3) or get in touch with me some other way if you have it, and send me your User ID (found under Settings -> API), and I’ll send you a party invite.